1. Burberry Storm Grey nail polish - a stunning grey that's almost a one coat wonder! 2. Pixi Lip Balm in Ripe Raspberry - wonderfully moisturising formula with a pretty rosy tint. 3. Botanics Facial Oil* - a must have for replenishing my skin at night after those cold, windy mornings. 4. Vichy Idealia Serum* - gives my skin a real glow and is the loveliest base for make up. 5. Avene Rich Compensating Cream - the perfect partner to the Botanics Facial Oil at night. 6. Rockett St George star candle holder - could be straight out of Professor Dumbledore's office and it looks fabulous on my desk! Is there anything you're particularly loving right now? The Avéne cream sounds amazing, and the packaging is super cute! The candle holder looks so cute! That Burberry polish looks stunning! I love Vichy Idealia Serum, it's one of my go to products. Oh burberry nail polish <3 beautiful shade! The Botanics oil sounds lovely. 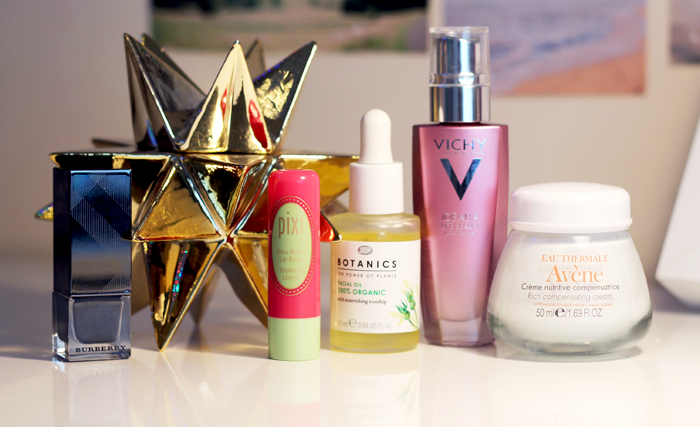 I'm really liking oils and serums at the moment! I really like that star, Dumbledore-esque indeed! That candle holder is so cool! The burberry nail polish looks gorgeous too. Good luck getting through your uni work! The Burberry shade looks incredible!!! Grey nailpolish sounds pretty wonderful this fall! I love that candle holder!!! October Glossybox | Pop Art Collector's Edition. The first book I loved. My New Desk: A Tour!